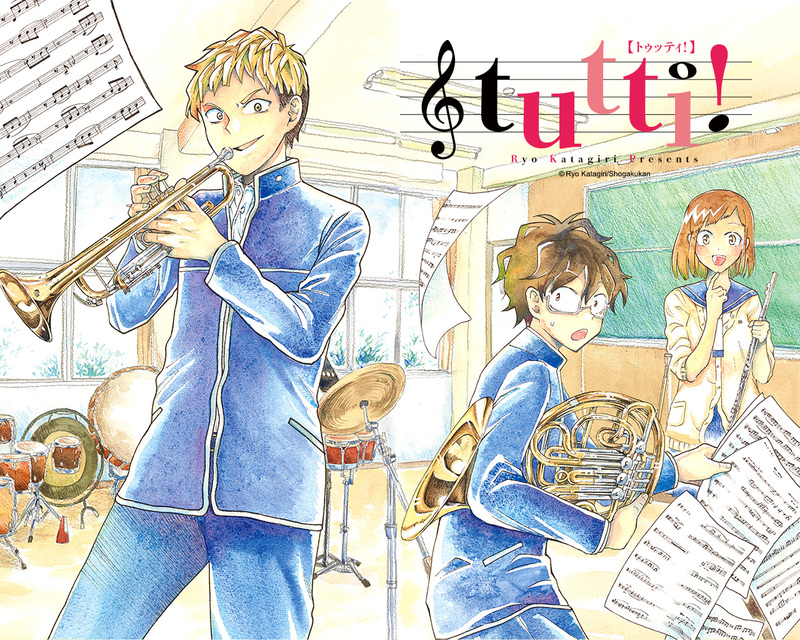 Ranjo Kei, Doi Naoya and Sakurai Reiko are the Brass band (club) of Kure high school. They are lacking members and so, they try recruiting/stealing people from other clubs including the basketball club. Will their annoying behavour payoff and increase the size of the Brass Band to play in the upcoming concert? Find out in this musical comedy...its a comedy with bass music. Tutti! began in issue 22/23 of Weekly Shonen Sunday by Ryo Katagiri. Katagiri is not a newbie but only has one other series to his name, Chuuganjike no Onmitsu, which ran shortly in Shonen Sunday Super in 2011. Like his previous work, Tutti! will most certainly be a short series.